I was chatting on the phone yesterday with a good friend. She was helping me with advice on a recent problem that has surfaced in my life. We had a great talk. It was a sojourn of a conversation — with left and right turns. In the end, we didn’t S.O.L.V.E my problem. Time, effort, sweat and a little luck will solve my problem. But the last thing she said to me really settled the entire issue. We ended, accepting that life throws curve balls now and then – but in the end – these are all 1st World Problems. 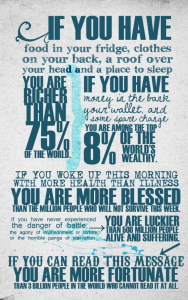 We are so Lucky to have our Problems. Since that chat, the framing of my “problem” has been forever changed. So, I will worry, and stress, and maybe even cry a tear or two over the next few months, but in the end — I’m grateful for my problem. 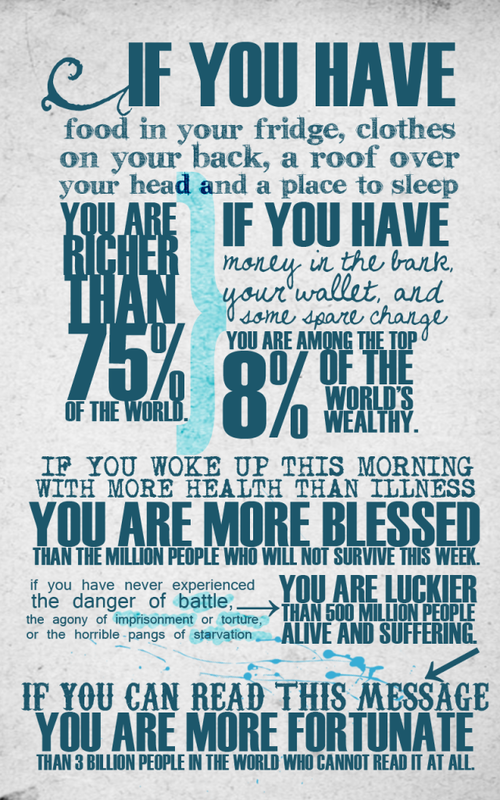 It’s so small and inconsequential compared to what others are facing.